Info Senator Malcolm A. Smith earned his bachelors degree from Fordham University in Business Administration with a concentration in Economics. He furthered his education with graduate work in Economics and Public Finance at Fordham and NYU. A real estate developer by profession, Senator Smith is no stranger to politics. While the State Senate is Malcolm Smith's first elective office, he has been a Senior Aide to former Congressman Floyd H. Flake, a Chief Aide to former City Council Member Archie Spigner, a City Hall Assistant to former Mayor Edward I. Koch and a member of the National Advance Staff for former Vice-Presidential Candidate Geraldine Ferraro. Senator Smith was a former executive in the New York City Mayor's Office of Economic Development and has served as the President of the Neighborhood Housing Services of Jamaica, in Southeast Queens. He created the Southeast Queens Housing Development Corporation, a not-for-profit corporation designed to purchase, rehabilitate and sell City and HUD owned properties, and was the President and Founder of Smith Development Corporation. Throughout his career in public service, Senator Smith has used his skills as a manager and developer of residential and commercial projects, to benefit the City of New York and its residents. His accomplishments are notable and he is credited with creating several initiatives centered on community revitalization and economic development opportunities. He is well known as the founder of Operation Excellence, a training program for students in real estate development, a feature on local television news. He developed the "Challenge to Minority Banks Program," which highlight the needs of and increased business for minority owned banks in the city. Deposits in minority banks rose to an average $22 million annually between 1983 and 1985. In 1985, as the president of the Neighborhood Housing Services of Jamaica, he created two citywide loan programs. The first was the home improvement optional loan program and the second, a mixed-use rehabilitation program designed to restore commercial and residential properties on commercial strips. 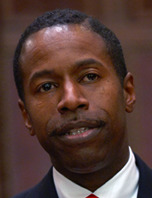 Senator Smith was successful in convincing five banks and the City of New York's Housing Preservation and Development Agency to capitalize the program with $2.2 million. As a private sector developer, he built over 100 units of housing in Southeastern Queens, Far Rockaway, and Brooklyn and some noteworthy commercial projects include the interior of the FAA building, Pathmark Plaza-Springfield Gardens, J. Foster Phillips Funeral Home-Saint Albans, and Baseball fields at Roy Wilkins Park in Jamaica. In a short period Senator Smith has made a name for himself within the Legislature as one whose philosophy is "Relationships Yield Results". In his first year 2000-2001 as State Senator he secured $10 Million dollars from the MTA for much needed improvement of their LIRR Stations within his District. In the same year a collaboration with Assemblywoman Barbara Clarke secured $1 Million for the Jamaica Clinic in Hollis Queens. The first of its kind in Hollis, NY. In his second year 2001-2002 collaboration with City and State officials engineered an agreement that yielded $10 Million to clean up the Westside Corporation Toxic Site in Jamaica, Queens. This was secured while the superfund was bankrupt. Senator Smith has secured $1Million for support service programs in the Rockaways as a result of the Flight 587 plane tragedy. This was accomplished by collaborating with Assemblywoman Audrey Pheffer and the Governor. Within 2 years Senator Smith has secured $22 Million dollars for his District separate from the recurring expenditure that the State Government afforded to all Districts throughout the State. He firmly believes "Relationships Yield Results". Senator Smith is married to the former Michele Lisby. They are the parents of two children, Julian and Amanda. Senator Smith also proudly serves as a trustee at the Greater Allen Cathedral in Queens, NY, where Floyd H. Flake and Elaine M. Flake serve as Pastor and Co-Pastor, respectively. In addition to his interests in community revitalization and housing issues, he considers the environment, health care, education, economic development and technology to be equally important issues.